my question is i gave red apples as a offering and the fruit never rots the apples been in the alter for like 3 months . when i go and touch the apples it looks like there getting eaten from the inside and the outside looks normal and the apples have like a white powder on them . does anybody have advice or tell me whats happening ? Put the apples outside and put out a new offering. On my Santa Muerte altar I usually have water or aloe vera juice; tequila, wine, or other liquor; dark chocolate (good quality); and flowers. I have read all the pages under this section "Altars: Questions and Answers" and unless I missed it, I don't see this specific question asked/answered. I have read where you can setup different types of spells from east to west, so obviously you can have multiple spells working on a single altar; however I am new to this and will be ordering the "Love Me" spell kit and the "Break up" spell kit. I have not yet figured out if I should be doing these at the same time or if I should focus on one of the kits and then move onto the others. In the event that I ever do figure this out and it is determined to do them at the same time, can I perform both spell kits on the same altar at the exact same time? I have a small closet like space at my office that no one will ever enter, which I think is ideal because my target of the both kits also works in the same office every day, so if proximity aids in effectiveness, she certainly will be close. Now this space is small, so I have setup a small wooden surface with metal legs that is probably only 2'x4' and is facing east. I have a couple other small surfaces that I could use for supplies and preparation, but only this single small surface for an altar. 1) Can the "Love Me" and "Break Up" spell kits be worked at the same time on the same altar? Do I need to shelter these spells from each other by dividing them in any way? 3) Will the "Break Up" spell be less effective if it is on the same altar that is facing east? Do I need to figure out a way to have it to the west of the "Love Me" altar or does it not really matter? (1) You can perform both spell kits in tandem, but not working them at the same time nor in the same space (altar). If you do them in tandem, then it would be customary to do love work in the morning, as the clock hands rise and to do the break-up work at night as the clock hands fall. If you want to work them one after the other, then the love me work would be done during the waxing moon whereas the break-up work would be during the waning moon (or vice-versa). (2) No working on the same altar for both spells. But yes, a cloth can be put down - black for the break-up work and red for the love me work. It's not absolutely necessary but useful for catching all the ritual remains for burial. It also makes things pretty and sets the mood. (3) No working on the same altar for both spells: you don't want your Love Me work getting splased with the mud from the break-up!!!! And yes, orientation does matter. Try and do the break-up in a West-facing direction if possible. Breaking the rules is only OK once you have enough experience to know why they're there and what they're doing. Your question has been merged into a long thread on altars and altar work. Please read this thread from the beginning and i think you will see that your query has already been answered several times. If, after reading this thread you still have questions, just ask and we will try to answer. Here is a small, modern Chinese altar table of type that may be found online with a simple search for "wooden Chinese altar table." As you czn see, there is nothing that particularly marks it as being an "altar" to the average eye. Most people would just consider it to be a "small Chinese table." Yes, pretty much. For generations, people who do candle work with limited privacy have burned the candle in sections -- for a limited time each night, then pinched the flame out -- and hidden it in a bag or box under the bed or in the closet. You can also load perfectly ordinary-looking decorative candles by wrapping a pinch of herbs or powder in your petition paper and putting it under the candlestick. Many candlesticks have hollow bases with felt glued across them. Pry it open enough to tuck your petition in there. Or you might be able to make the little packet flat enough that the candlestick will stand straight and true. Tape it to the bottom of the candlestick and light it innocently. Or light an ordinary candle dressed with oil and a word of prayer, and innocently place it next to a picture of the person you are working on or one that represents the situation you wish to bring about. Hi there, everyone. I apologize in advance if I am not posting under the correct board, but I felt that this one would probably be the most pertinent to the subject matter at hand. If it isn't, please feel free to point me in the right direction . I just had some general inquiries about an altar setup for Hoodoo work. I want to do things the proper way in Hoodoo. Are there set guidelines on what should be on an altar? How should it be set up and what are some good items to have on it? Also, is there a ritual involved before working with the altar (similar to the "opening of the circle" in Wicca)? I apologize for not knowing these things, but I have had little luck researching this subject matter, and the sources I have found seem vague at best. Also, any sources that could answer these questions for me would be greatly appreciated. I went ahead and merged your post to an established thread on the topic of altars. Be sure to read the previous pages to get some great insight. Also, on the Lucky Mojo Hoodoo Rootwork Hour Professor Ames's topic for the panel discussion was about altars. Be sure to listen to the October 6, 2013 episode. Tewsday wrote: I want to do things the proper way in Hoodoo. Are there set guidelines on what should be on an altar? and what are some good items to have on it? Think of an altar as a spiritual workbench. Whatever materials you need for the spell you are working -- that's what belongs on your altar. Besides clients' candles, honey jars, and skull lights, my altars have written prayers for non-clients, lamps dedicated to mighty justice workers and spiritual workers of the past and to a few church and folk saints, MISC church fans for wafting incense smoke, sage and cedar bundles for cleansing, heart and flower decorations where appropriate. I also dedicate a portion of my justice and healing altar to the Crystal Silence League, so there is a bowl of glass spheres in several colors, atop a stack of printed prayer requests. Also, is there a ritual involved before working with the altar (similar to the "opening of the circle" in Wicca)? "For we are saved by hope: but hope that is seen is not hope: for what a man seeth, why doth he yet hope for? Good evening, all! 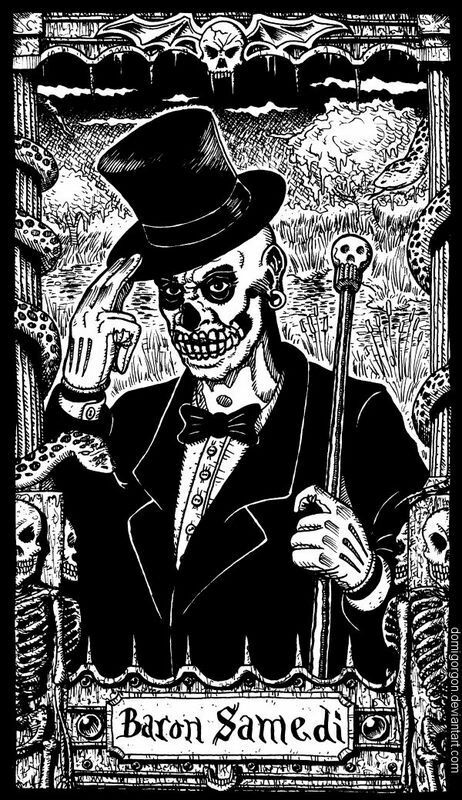 While I'm new to the LuckyMojo forums, I'm exceptionally impressed with their products, the communal atmosphere that has been created here, and most importantly, the importance of "hoodoo literacy, understanding and ethics" is commendable and honorable. With that said, I have a general question that I'm hoping some or many might be able to help me with. Essentially, I'm curious about the best way to cleanse (in the literal sense) one's altar or workspace without grounding out the energies that have been developed around this space. It may be as simple as cleaning any hard surface, but I thought of this as a good way to introduce myself to the community. Any help or insight would be greatly appreciated; I truly look forward to becoming more involved in this community. Welcome to the Lucky Mojo Family, Awarewolf! And LOVE you r screen name!! Catchy!! When you get time, we'd love to see you introduce yourself via the introduction thread. We can then give you the links to the most popular threads, too. If you are only interested in the washing, that's the product!!! Let us know if you also wanted spiritual space cleansing because there are other products that you can use. Thank you so much for the kind words and the great reply! I will certainly introduce myself using the Introduction thread and establish myself in a more "formal" way (minus the pomp and circumstance that are normally associated with the word "formal", I suppose). I appreciate you sending me the link that you sent me and it looks like an extremely versatile wash. With that said, I should have been more specific...based on what I read of the Chinese floor wash, it seems to be more applicable to a larger working space or sanctuary. While I'll no doubt use this in the near future,I'm looking for something on a smaller initial scale. The area that needs cleansing (basic hygienic cleansing) in this case is literally no larger than a flat surface upon with I dress and anoint ritual items and practice. After using it for some time now, I just want to clean it up again, but want to know if I should/can be as simple as using soapy water, or if there's a different household item that might accomplish the same goal. I apologize if I'm not describing my intentions clearly, but I'll be happy to elucidate if desired! Wishing you love, peace and light. Just mix a couple of teaspoons of it with water and cleanse your altar. I use Chinese wash for everything!! I wash: my statues with it; my furniture; Crucifixes; picture frames; almost everything!! It works beautifully on wood also! If you're still not comfortable doing that, then, get some plain castile soap or some lemon scented hand soap. Mix some Van-Van oil with it and use that to wash your altar. Also you might want to listen to the 10/6/13 (last Sunday) BlogTalkRadio production of the Lucky Mojo Hoodoo Radio show, they discuss altars and cleansing/upkeep of altars. It is a great show to listen to weekly -- even if you miss it on its Sunday broadcast, you can listen to it online at any time. I've merged your post into the long thread already existant on altars. You'll probably find lots of useful information in addition to the wonderful words that have already been provided. As I continue to "test the waters" of the Lucky Mojo forums and continue to encounter multitudes of kind individuals with seemingly boundless wells of knowledge, I'm humbled and inundated - I find myself in what I'd call "a happy problem." So, thank you all for being so accommodating and kind. I will absolutely try variations of the ideas that have been presented and keep everyone posted on how the altar, subsequent conjures and any other workings behave. I'm trying to brush up on my Herbology and am reading cat yronwode's book in the hopes that I can minimize cost but bring about effectiveness. I'm sure you guys hear that a great deal. I really look forward to being a part of what is clearly a solid and loving community but one that is also a powder-keg of wisdom. I'm starting my praying station inside my closet so no one will see or touch my saint. I was wondering would it be ok if i make a small corner for my saint but with bags, coats and other items on the other side of the closet? My main concern is my boyfriend not seeing my saints . He's very closed minded and wouldn't understand my personal belief. Amor Prohibido, this is a hoodoo forum, and most hoodoo workers are Protestants, so they don't work with the saints. But many of them, too, have to hide their spiritual work, so I'm sure our readers will have many useful ideas for you. I use a tall cabinet with closeable doors that I got at Target (a major chain store in the US). I keep all my private spiritual stuff in there. Hello, everyone. I hope this is the right place for this question - if not, I'm sorry... I decided to clean my altar off, including hand-washing my altar cloth, and rearrange it. I took a few things completely off that hadn't been prayed over, if you get my drift. During the time I was cleaning, I kept telling the spirits (by the spirits I mean the dead I had called upon like someone suggested on this forum and my ancestors) that I was cleaning up for them. That it needed to be done. Well, later that afternoon I became really sick, hospitalization sick, and it lasted about 3 weeks. Sent my prayer request to TCSL and everything. Now, I want to completely change my altar due to I've found a better one with drawers, but I'm afraid now. Seriously. My questions are: should I offer a gift to each different statue and explain I need to change altars? OR is something wrong all together with me getting sick in the first place? I'm relatively new to hoodoo. In fact, I was just accepted by Miss Cat herself into her course on Sunday - YAY! - so any advice from someone who has experienced the same thing, or any advice from someone who just knows the answer, will be greatly appreciated. Thank you. 1BlessedCat, cleaning an altar is not something that should lead to hospitalization. There could be something else going on, both mundane or magically connected, but that is impossible to tell without a reading. Altars need cleaning from time to time and if you are doing this in a respectful way, which it sounds like you were, there should not be an issue with this. Once the altar is re-set it is a good idea to leave an offering, but beyond that I wouldn't be worried. Of course, if it feels like something else is going on you might consult with a reader/rootworker. Thank you so much. I was thinking the same thing, too. I'm going to burn some sage over in that area and take a cleansing bath. Greeings and blessings to all on the forum, especially the moderators who all do a fine job of tackling our problems, advising and sharing their thoughts and experiences. I normally do more reading and reasearch than ask questions on the forum and am attempting to find a post where many shared their preferences of what was placed on their alter. Thanks. Have you read all the pages on this subforum? Lots of good information here. What kind of an altar are you setting up? 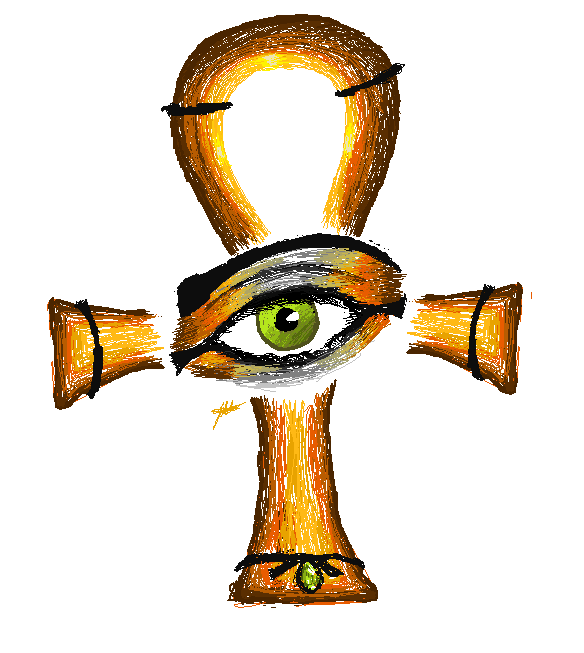 I'm new to Hoodoo and I'm learning. I read on this thread that you should keep your altars private, except for your ancestor altar, which some have advised can be out in the open. I have an enclosed porch, facing west, with a cement column in the middle that just looks like an altar (though the front porch faces west, the items on the altar would face east), and as soon as I read the term "altar," I thought of this spot for a fixed money altar dedicated to increasing my lottery luck, which I'm most interested in. The concrete column desperately looks like something should be placed on it. I live on a block with four houses that were built to look identical. My neighbor does not have his front porch enclosed, and he uses his concrete columns for plant stands. Would it be inappropriate to turn this column into a money altar because it's on my front porch? I'm not the most social person and I don't encourage people to just drop by my house whenever. I don't get too many visitors, and truth be told, I don't feel like I would need to hide what I do or my beliefs. It's my house and my porch. I pay the mortgage here. I live out of state and all my family lives elsewhere, plus, I've been interested in magic since I was a very young child. That's just me. My family, if anyone, would know and come to expect something like this from me. I don't think I would place real paper money on this altar, because mail and packages are delivered regularly (though people don't step foot on this front porch because I keep the front door locked and if I put plants on this column...green!...I could tuck money into spots here and there that wouldn't be seen) but I wouldn't mind placing candles or anything else there. And it's a concrete surface, which makes me feel better about burning candles on it. Is there a reason altars should be hidden away? Would it negatively impact the effectiveness of my spells if my money altar were on an enclosed, locked front porch, capable of being seen by anyone on the porch? You know, it sounds to me like spirit is calling you and telling you to put your money altar there. That's what it sounds like. 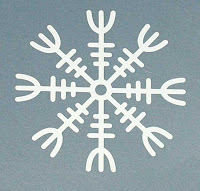 But, the concern is indeed people seeing it and then: Jinxing it with cruel thoughts; upsetting the spirits by questioning it; getting into the way of the flow of energy; unwittingly doing many negative things to it (the list goes on). More experienced root workers can dispel the negativity but, you are new to Hoodoo. So, I wouldn't take any chances right now. My suggestion is to put it there but to have some sort of barrier in place to prevent anyone from seeing it. I would like to build an altar to some of my dear sweet relatives who have passed on. I live far from their graves and would like to honor them by burning a candle and offering water, coffee etc. I can't erect an altar in my home in plain view. Has anyone ever made or used a portable altar. Does anyone have any ideas about constructing an altar that can be stored away when not in use? Thanks in advance for any ideas, thoughts or comments. Dave71us, start researching here in the forum perusing the Altars questions and answers thread and you will get a lot of ideas on how workers have created and using portable alters. Good Luck! Dave71us, there is a ton of information that answers this question in this very thread. I encourage you to read through it. An Ancestor altar doesn't have to be fancy. If you have pictures of your beloved relatives you can put them in nice frames with a simple candle. The offerings you leave can then be put away when it feel necessary to do so, but you can leave this "altar" up all of the time. Thank you so much! I really like your ideas and think they will work for me. I'm just getting my bearings around here and am still a little dazed by the sheer volume of information. I tried to look through the topics here to see if I was in the right realm to ask this question, so if this has already been answered somewhere... I deeply apologize, as I was not able to find it. My question revolves Altar Creation. As far as the specificity of the kind of Alter I am wanting, it would more likely be an Alter to my Guides. Naturally, my heart wants to say just do what I feel led to do... but I question myself because I want to make sure that if there is a ritual to follow, that I am doing that. The good news is that there isn't "one official way" to set up an altar. I would encourage you to read through this thread and check out some of the amazing photos that have been posted. There are as many ways to set up an altar as there are people creating them. If you are making an altar for your Guides, then listen to them and see how they want it to look. Do we need to work on an altar? I ask because living conditions (space, privacy, cost) makes it highly difficult to have an altar set up. Also, what's the proper way to set up an altar? You'll find the answers to your questions and lots more in the existing thread on the subject I've merged your post into. After reading if you still have questions, feel free to ask and we'll be happy to answer! Can I put two altars (one for money and one for love) on the same shelf? If I start a ritual while the clock hands are going up, but finish while the clock hands are going DOWN, does that affect the ritual? Or does the START of the ritual what matters? Yes you can put two altars on the same shelf, give them each their ''section''. Just try and keep two types of work that are diametrically opposed (crossing and healing for example) away from each other (and even then, if the shelf is East-West, healing can be done on the East extremity and crossing on the West extremity - you manage with the space you have after all). Spell remains should be disposed of as soon as possible after the the given spell since this ''seals the trick'' or ''sets things working'' and is considered the conclusion of the work. If it's ashes and candle remains from general altar up-keep, unrelated to specific spell-work, then you can dispose with the timing and method of your choice. I just moved to a new city across the USA and I'm just setting up my spiritual supplies. I didn't bring any of my old furniture so I wanted to know if Lucky Mojo sold actual altars (I searched and didn't find anything, maybe there's something I missed). If LM doesn't sell them, I can buy one separately from another store. What do you recommend? It should be all wood and contain no metal, correct? I read this somewhere. If there's anything else I would need to complete my altar for my work, please let me know. Thank you for your time. Hoodoo is a form of folk magic, not a religion, therefore although the place where we do our work may be called an "altar" by anthropologists, in real life, as practiced in black American culture, a table top, mantel piece, bureau drawer, chifferobe, night stand, window sill, vanity, book case, or carpenter's bench will be found sufficient. Here is an altar in a bookcase, courtesy of Candelo Kimbisa of the Associaition of Independent Readers and Rootworkers (AIRR). It consists of altar work on four levels: Catholic Saints, Asian Deities, the 21 Divisions of Dominican Sanse, and Ancestors. Please read this thread from the beginning for many pictures of how conjure workers set up their work on various places. We do sell bandanna-sized altar cloths, but we are not in the furniture business. What tools is needed to make a Hoodoo altar? Im planning on buying from Lucky Mojo. Hoodoo is a form of folk magic, not a religion, therefore there is no set list of tools used by every worker. You will want a fireproof surface and candle holders if you use candles. You will want sewing thread, cloth, and scissors if you make mojo bags. You will want containers for your herbs and roots. You will want statuary if you like to use it, but it is not needed. Here is the set-up for a spell i worked on the floor. 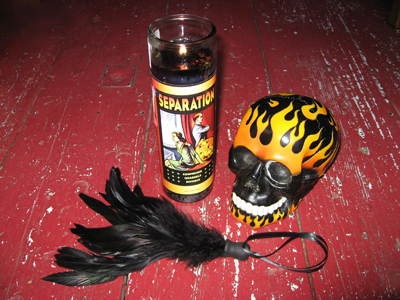 The flaming skull and Separation vigil light are to drive away an abusive husband; the black feather whisk is used in person to cleanse the client from residual connections to her ex. So, this is a pretty obvious question, but I legitimately want to know. I'm leaving town for a few weeks. I currently have a few candles set to return my ex, and a st martha altar. How does one go about leaving them in a small apartment unattended for maximum 2 weeks? I live in a small apartment by myself and nobody goes in to check on it unless I ask the neighbor or landlord to. Should I leave my workings alone where they are or take them with me? I'm going to be staying at a friends house and he's a little creeped out by it all. If you are unable to take your work with you and don't want to leave candles lit on your altar while you are away you can have lights set for you at Missionary Independent Spiritual Church. http://missionaryindependent.org/candle-services.html You can have them set in "Runs" which means as one candle goes out they will set another for the same purpose to keep the work going. I have a question about altar disposal and retirement. 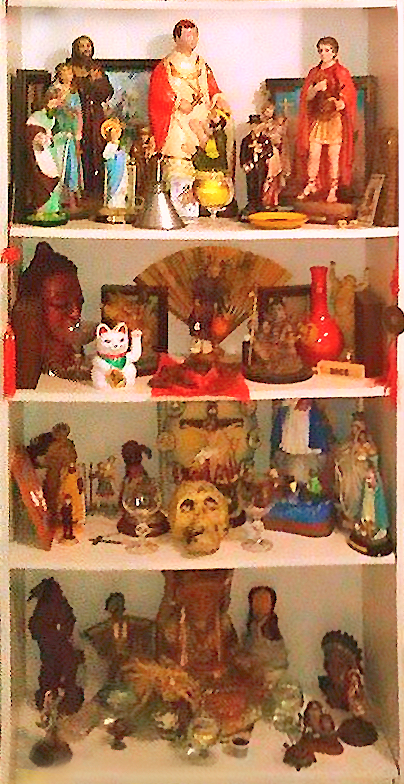 If I have been petitioning a particular saint or deity for a length of time (and giving offerings to her), but no longer feel the need to petition/work with this particular entity, what would be an inoffensive way to "retire" that portion of my altar? Additionally, what should I do with the offerings? Thanks in advance for reading. I have a question about my ancestors where I light candles, put glass of water and a kind of candy my mom loved, unfortunately I had a dream with her...where she tells me so clearly; "No More Candles Please", and I'm so and confused, I don't know what it means, I really though I was doing something good for them, (Mom, dad and my brother). Please if there's something that someone can contribute towards this, It'll be so much appreciated. Thank you again. Next time you light her candle and pour her a glass of water, leave her a note asking if she would like something else instead. It depends: did she grant your petitions? Thanks Miss Michaele for your response, it means a lot to me, my mom and I were very close and when she went, I felt my soul went with her, I didn't want to live anymore. But God is so great that has help me to coupe with such pain. I do put flowers (fresh from my garden) beside her picture, and candy; but the dream I had, was sooooo real, is like if is she was right there, and when she (mom)told me "no more candles" she looks sad. thank you again. I think you misunderstood. I was responding to someone else. Continue your altar and just say: "This candle is being lit for any of my ancestors who need or want the light". Then, wait and see if your Mother comes back to you in another dream or if you get a sign. Yes, she granted my petitions. I have personally found that if I 'retire" them and then need them later, they won't help me. But, that's just what has happened to me. If this were me, I would give this Saint a small area that is all theirs. Maybe a small corner of a cabinet? And I would still give offerings once in awhile. First of all hi to everyone here! I used to be ariela but my account became inactive. Anyway, a candle (Sun candle) I had bought from LMCCo had fallen to the ground a few times and the glass cracked, and later disappeared from the space in which I had it. Usually, for months, things were peaceful where I live and no one touched my things on the table. Recently, though, some undesirable people briefly stayed there causing scads of problems and damage. I figure that, for certain, there is someone working against me and what I want, these people are troublemakers (fortunately they are gone, but so is my candle and other stuff of mine), and I read Miss Cat's article on Altar Messers. 2) how to find out more information on them (a reading, yes). Thank you Sts. Jude, Expedite, Michael and Anthony. Thank you stars, spirits. Welcome back, ariela / ellalorena! 1) You will want to cleanse and remake your altar space. • Take everything down and sweep with a new broom. • Use appropriate cleaning materials on every part of the altar and what goes on it. • Put the same energy into rebuilding it that you did into originally constructing it -- but this time, build in some protection. • Use four silver dimes for protection. If your altar is rectangular, set the dimes, face-up under the four corners or four legs of the altar. If it is triangular, use three dimes. Pray Psalms 91 and 121 over them before setting the dimes in place.